Summer is almost here and I’m about as excited for its arrival as I am for my next dentist appointment. Still about two weeks off, I can already feel summer’s grip tightening around my sweaty neck, its stuffy hot breath on my face. So this year, like the last, and every one before it, I’ll comfort myself in one of the best ways I know how: by eating copious amounts of ice cream and other cold treats. I think I’ll live through the heat waves if I can have this little mountain of refreshing sweetness. Last summer I discovered snoballs, a New Orleans spin on shaved ice, and now this year I found the Korean version, patbingsu, at koreatown’s Korydang. But while other forms of this frosty treat are usually just shaved ice and a flavor syrup, patbingsu way more than just flavored slush. When I ordered the green tea version at Korydang, out came a cherry topped-mountain of green tea flavored ice cream, surrounded by mochi balls, sweet red beans, and chunks of mango, kiwi and strawberry, all which were hiding the bottom layer of slushy, cool shaved ice, made a creamy green color by green tea syrup and one of my all time favorite ingredients, condensed milk. 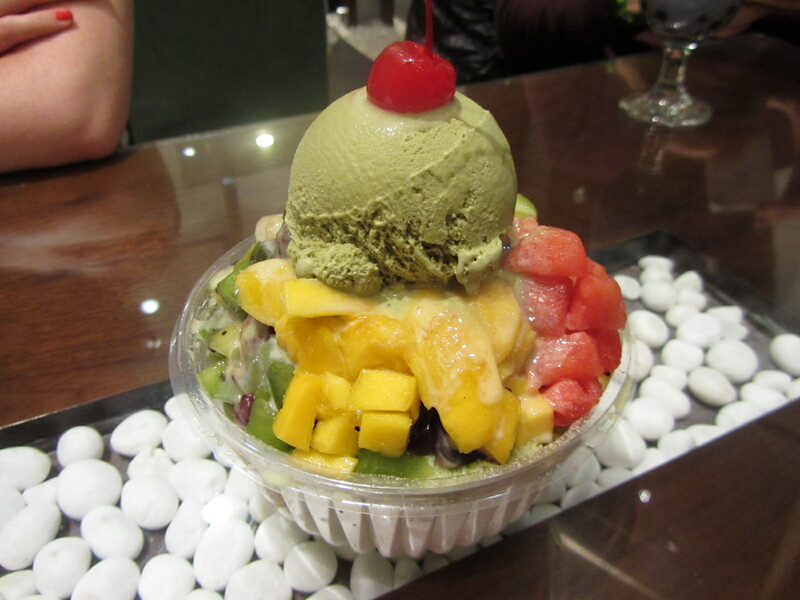 Refreshing, creamy and light, and mixing the different smooth, gummy, and chunky textures of the fruit and mochi toppings, this korean take on shaved ice was not only delicious, it was fun to eat. And when the summer months get really nasty around here, which they inevitably will sooner than I’d like, this is the kind of fun I’ll be looking for on those sticky hot days in the city. I think I found the one. The official food of summer 2011. Forget ice cream. Forget gelato. I’ve discovered sno-balls and there’s no looking back. I’m hooked. 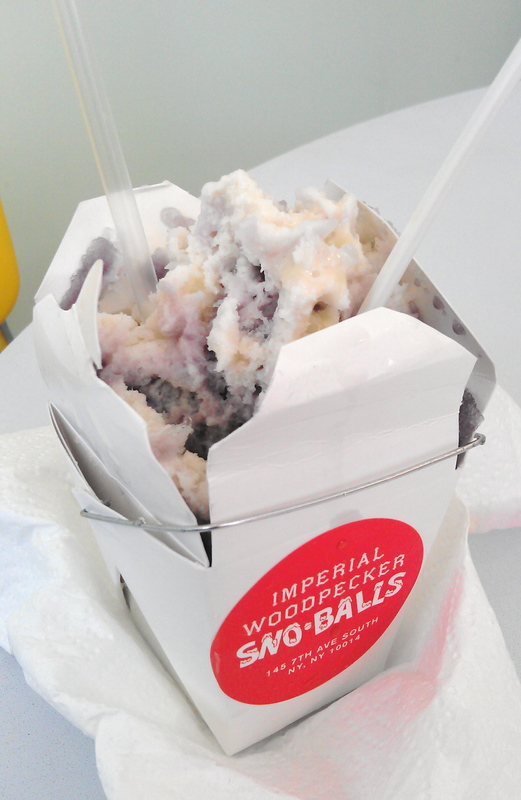 While walking down a shadeless 6th avenue in the West Village, feeling my skin literally sizzling under the relentless mid-afternoon sun, I saw it: Imperial Woodpecker Sno-Balls. My new favorite summer treat. It's been decided. What the heck? Woodpecker balls? Wait, no, sno-balls? Wait, huh? Intrigued, shiny faced, and sweaty, I stepped into the tiny, crowded shop. A sign on the wall listed dozens of flavors: birthday cake, watermelon, buttercream, root beer, banana, dreamsicle and even mojito among others. Underneath it, two shelves were lined with bottles of syrup in a rainbow variety. Sno-balls! I get it! Like snow cones, but in better flavors! Because I found out these were a New Orleans style treat, I stuck with the theme and tried the Mardi Gras King’s Cake flavor… with condensed milk topping. (I’m a pretty firm believer that if condensed milk is ever an option, the answer should definitely be YES.) What I got was a Chinese take-out style container packed high with shaved ice and generously doused in a violet-colored syrup flavored like the traditional cake served in New Orleans around Mardi Gras (sometimes topped with green, gold or purple icing, hence the color here). Drizzled over the purple mound of snow were thick drizzles of sticky, sweet condensed milk. In a word: awesome! In more words: delicious, creamy, soft like clean, freshly fallen snow, sweet but not in an overtly chemical or artificial way, refreshing and frosty cold. It was quirky and different, new and fun, and well, I loved it. I want to try all the flavors, and with another two months of summer, I think I might just set out to do that. I’m making it the summer of sno-balls.